Japan should bolster its marine force and introduce surveillance drones, a defence review paper says, highlighting concerns over China and North Korea. The paper also called for better defences against missile attacks and the potential to attack enemy bases. Japan's military is constitutionally limited to a self-defence role. But PM Shinzo Abe is looking to expand the scope of its activities - potentially a highly controversial move that would anger its neighbours. Japan is embroiled in a bitter row over islands with China and is deeply concerned by North Korea's nuclear ambitions. The interim report is part of a defence review ordered by Mr Abe, with final proposals due by December. On Sunday, Mr Abe won back control of Japan's Upper House, meaning he now controls parliament and would be in a stronger position to reshape Japan's current defence strategy. Under Article 9 of its post-war constitution, Japan is blocked from the use of force to resolve conflicts except in the case of self-defence. "This will guide the focus of the direction that the Self Defence Forces should be heading going forward," Japanese Defence Minister Itsunori Onodera said of the report. Amphibious units that could be dispatched quickly to remote islands were needed, the report said, and surveillance equipment to detect "at an early stage signs of changes in the security situation". The report also called for a strengthened ability to "to deter and respond to ballistic missiles". "Japan needs to enhance its ability to respond to ballistic missile attacks in a comprehensive manner," Kyodo news agency quoted the report as saying. But officials have been keen to emphasise that this does not mean Japan is eyeing pre-emptive strikes on enemy targets. "It is necessary to consider whether we should have the option to strike an enemy's missile launch facilities," an unidentified defence ministry official told Reuters news agency. "But we are not at all thinking about initiating attacks on enemy bases when we are not under attack." The move comes amid a raft of tensions and potentially challenging security issues. North Korea conducted what was widely seen as a long-range missile test in December 2012 and followed up with its third test of a nuclear device in February 2013. China, meanwhile, is locked in a dispute with Japan over East China Sea islands known as Senkaku in Japan and Diaoyu in China. Japan controls the islands but Chinese ships have been sailing in and out of what Japan says are its territorial waters since late last year, as tensions increased. On Wednesday Japan scrambled fighter jets after a Chinese government plane flew in international air space near the islands. China said it was on a routine training mission; Mr Abe said it was "an unusual action that we have never seen before". 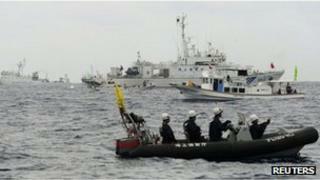 Japan has also voiced concern over increases in China's military spending, accusing Beijing of a lack of transparency.